COLUMBUS, Ohio -- The first thing you notice are her shoulders. Strong and symmetrical, they are well defined, powerful, cut, ripped and chiseled -- deserving of all the superlatives one might heap upon a pair of exquisitely crafted deltoid muscles. But on Gabby Douglas, the 2012 Olympic all-around gold medalist, artisanal delts are more than mere vanity plates; they are the tangible representation of the work she's done so far, and of the seriousness of her intention to become the first woman since Czech gymnast Vera Caslavska in 1968 to repeat as Olympic all-around champ, and the first American in history to accomplish the feat. "Sometimes I FaceTime with my mom and I'm like, 'Mom, look at my arms,'" Douglas says, raising her brows and widening her eyes as she stresses the words "Mom" and "arms." Despite firsthand knowledge of all that's gone into shaping those shoulders, including four-to-six-hours-per-day, six-days-per-week workouts like the one she just finished here at Buckeye Gymnastics, Douglas seems almost surprised by her current physique. Gabby Douglas wants to repeat as Olympic all-around champ -- a feat no American woman has ever accomplished. She is taller, still slim, yet visibly more muscular than the Gabby Douglas of the London Games. She has shed her shy 16-year-old demeanor, speaking with more confidence and spark, yet with the measured vocabulary of an athlete who's spent the past two years having her interviews and intentions scrutinized. "I'm stronger than I was last time around," she says. "I think it's a maturity level. When I'm tumbling, I'm like, 'Wow. This is so much easier than before.'" Here, she lingers on the word "easier." "My gymnastics still feels light and effortless. Thank you, Lord, for blessing me with this talent again," she says, "a stronger talent." That sentiment alone separates Douglas from her predecessors, none of whom would call their attempt at returning to competitive gymnastics "easy." To many, Douglas' seemingly carefree attitude toward a run at Rio signifies a lack of understanding about how demanding the next two years will be. She is working with aging machinery -- she'll be 20 during the qualifying window for the 2016 Olympics -- and competing against a young crop of American gymnasts that includes two-time defending world champion Simone Biles, 17, a gymnast Mary Lou Retton recently called "unbeatable" and "the most talented gymnast I've seen in my life." Biles has dominated post-2012 competition (she was too young to compete in London), and if Douglas makes it back to top form, a Douglas vs. Biles all-around showdown could well be the most-hyped storyline of the Rio Olympics. Even beyond Biles, however, are junior national champions Bailie Key, Jazmyn Foberg and Douglas' current training mate, Nia Dennis, who will move into the senior ranks in the coming years. Few outside the gymnastics world have heard of them yet, but the same could be said about junior gymnast Gabby Douglas in 2010. Douglas says she very much understands how impossible her goal sounds, especially to those within the sport. With her new coach, Kittia Carpenter, she says she focuses only on the positive, only on whatever skill or routine she is working on today, and allots zero mental space for dwelling on what she has already achieved, what is written about her online or the circumstances that brought her to Columbus. But she is still an 18-year-old girl with an 18-year-old brain, so she and her coach admit that has not always been easy. "I tell her, 'They don't know you. Your body is ready, you're mentally prepared and you're capable of this,'" Carpenter says, "She will step up and show everybody that she can make a comeback. If you trained with her, you would see it and feel it, too." Although Carpenter has been coaching Douglas for only a few months, she says when Douglas arrived in Columbus in August, she immediately felt like "one of my kids" and "just fit from the beginning." The road to Buckeye Gymnastics, however, was a bit bumpier. After taking nine post-Olympic months off to bask in her golden glow, pose for magazine covers, cash in on endorsement deals and travel with the Kellogg's Tour of Gymnastics Champions, Douglas returned to training with coach Liang Chow in Des Moines, Iowa, in May 2013 with her sights set on making a run at Rio 2016. Then, two months later, she left Iowa without public explanation and returned to Los Angeles to train at a local gym. In April 2014, she returned once again to Iowa, this time seemingly for good, and announced her intentions of competing at P&G Championships (the sport's national championships) in August and, should she be named to the team, the world championships in October. In the lead-up to London, Douglas had lived with a host family in Iowa while her family remained in their hometown of Virginia Beach, Virginia, but now that she was older, she knew she needed to find a place on her own. But, she says, "I hate being alone." So her maternal grandmother, Carolyn Ford -- Miss Carolyn to everyone who knows her -- retired from her job of 35 years at the U.S. Postal Service to move from Virginia Beach to Des Moines, allowing Douglas' mother, Natalie Hawkins, to remain with her other three children in the family's current L.A. home. "I am so thankful for her," Douglas says of her grandma. In July, Douglas and her grandmother moved into an apartment together. But within weeks of the move, Chow confirmed that Douglas had left his gym once again, prompting speculation as to what caused her departure and lighting up message boards with chatter about whether Douglas had ever been serious about returning to competitive gymnastics. "She has wanted to continue competing since she won the Olympics," Hawkins says. "We told her she needed to take advantage of her opportunities while she could, but it was a constant battle. 'When am I going back to training?' she'd say. 'When am I going back to training?' She wanted to stay [with Chow]; she wanted to get back to competition. She didn't want to leave. When I hear people call her a gym-hopper, it breaks my heart." On her departure from Chow's gym, Douglas says she will not divulge details out of respect for her former coach, saying only, "There was an unfortunate situation in Iowa and I had to relocate and find a new coach." That unfortunate situation began in 2013, when business negotiations between Chow and Douglas started to break down. She left Iowa and returned to Los Angeles to train while she and her agent negotiated terms with Chow. "I won't get into specifics, but the business terms under which Chow wanted to work with Gabby moving forward toward Rio were not business terms Gabby felt were in her best interest," says Lowell Taub, Douglas' agent at CAA Sports. (Chow did not return multiple messages seeking comment). 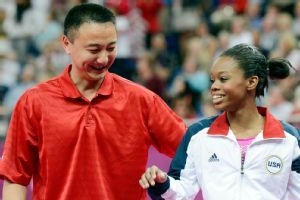 Gabby Douglas was coached by Liang Chow at the London Olympics, but the two split up earlier this year. During the contract negotiations, Douglas and her team believed they would be able to work out a deal, so she returned to Iowa in April to continue her training. "Both parties worked for many months trying to find a business partnership that worked for both parties," Taub says. "But after many, many months of conversations, we couldn't come up with terms that worked for both Chow and Gabby." For her part, Hawkins says she had strong feelings about what her daughter should decide, but remained fairly mum, wanting her daughter, who is legally an adult, to make the decision that was best for her. She told her only to listen to the advice of her agent and lawyers, and then make a decision she would not regret later. "Once her decision was made, she was asked to leave the gym," Hawkins says. "She's a smart little girl. She can tell when someone is asking for something that is outside the range of what they should be asking for. So we set out to find someone who would be willing to coach the Olympic all-around champion. We thought it would be easy." But the gymnastics community is a small one, and finding a new coach was not as easy as Hawkins had expected. A few coaches turned down Douglas out of respect for their relationship with Chow. Others, Hawkins says, said they didn't feel qualified to take on a gymnast of her caliber and still others were scared off by her reputation for switching gyms and the fear of failing to help her achieve her goal. "Some people weren't comfortable with the level of attention and spotlight on Gabby," she says. "We had to find a coach who wouldn't be distracted by it." Earlier in the year, Douglas had met 15-year-old Dennis at a national team camp in Houston and the two immediately clicked as friends. "I was watching video of her one day, and was like, guys, she trains in Ohio," Douglas says. "Maybe we can consider Ohio." A coach Douglas had been working with in L.A., Fernando Villa, had recently taken a job at Buckeye Gymnastics, the gym where Dennis trains, so Hawkins called and asked if Villa's head coach, Kittia Carpenter, would be willing to take on her daughter. "She said I was welcome to come and try it out," Douglas says, "so my grandmother and I drove from Iowa to Ohio." Carpenter says she first cleared the invitation with Dennis, who welcomed Douglas with open arms. The two have since become more than training partners; Douglas says they are best friends who hang out outside of the gym, dream about competing in Rio together and pick each other up on tough days in the gym. "I try to motivate her and keep her positive and she gives me advice, too, and encourages me," Douglas says. Although Douglas has the experience of competing in the Olympics -- and winning -- Carpenter says no one inside the gym would know Douglas is gymnastics royalty if not for the occasional camera flash during a training session. "She comes in like everybody else, lines up like everybody else and doesn't consider herself extra special," Carpenter says. "She has a very tough competitive spirit, but the kind-hearted, thankful person shows up in workouts." And Carpenter says that despite the pressure being heaped upon her as a coach, she never thought about turning Douglas down. "I couldn't imagine telling any kid no, let alone an Olympic champion," Carpenter says. "People thought I was crazy to accept that challenge, but I believe in my coaching and I believe in her. So I didn't have those doubts that other people seem to have." On this unseasonably warm November afternoon, Douglas says she has a lot to be positive about right now. She and her grandmother recently moved into a new apartment, which her mom and sisters flew out to help decorate, and her training has been going extremely well. She's working on a new vault and new beam and floor routines, and she and Carpenter feel like her difficulty levels on all the events are now internationally competitive. She understands, though, what she is giving up for this dream. Outside of the occasional trip to the movie theater and dinners at home with Grandma and a few friends from the gym, her life looks very little like that of most high school seniors. She takes classes online through an L.A.-based school for kids in the entertainment industry, and flies back for a handful of in-person tests each semester. She has no time for dating or dances, but none of that could compare to making another Olympic team. At the end of November, Douglas and Carpenter flew to Houston to attend the final national team training camp of the year, where national team coordinator Martha Karolyi officially named Douglas and Aly Raisman, the 2012 Olympic gold medalist on floor exercise, back onto the U.S. women's national gymnastics team. That makes both women eligible for international competition beginning in 2015, and is a sign that Karolyi sees future competitive potential from two of her London stars. "When I heard I was added to the national team, I was elated," Douglas says. "To end the year with this was absolutely awesome. I'm confident it's a good sign that I'm on the right path. My goal is to continue to dig deep and work hard." Those shoulders, it seems, have become equipped to handle more weight.